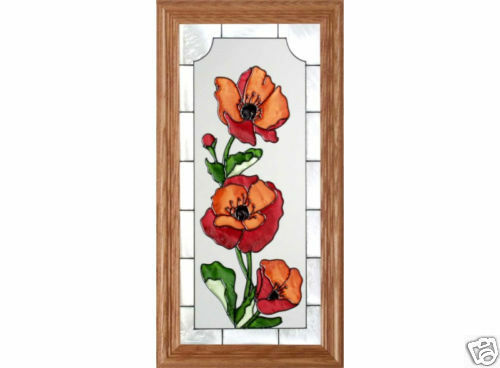 "Stained Glass POPPY Framed Panel" Giant poppies and glorious hues of red will add color and drama to your favorite window! Wood-framed in high-quality Wisconsin hardwood, this hand-painted vertical panel measures 11.5" wide x 22.5" high, and comes with two frame-top hooks for hanging. Specify your choice of frame finish: Medium Oak (standard-shown), Whitewash or Barn Board. FREE Chain Kit Included!!! On Mar-02-10 at 08:54:27 PST, seller added the following information: Shipping ONLY within the Continental U.S. Please contact for shipping quote before buying if you live in Hawaii or Alaska. Made in the USA by Silver Creek.